Kevin Smith is returning to the DC TV Universe. 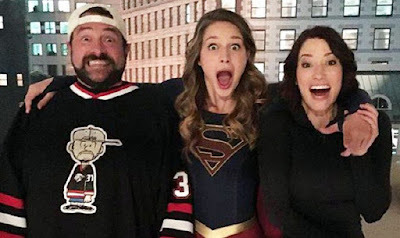 The Jay And Silent Bob star recently revealed on his Fatman On Batman podcast that he’ll be directing another episode of the hit DC Entertainment drama, Supergirl. "I go up to Supergirl, when is it? I’m doing Episode Four," said Smith. "I’m doing an episode, I shouldn’t say which one because I don’t think we’ve announced it yet… I could still get fired if they dig through my tweets." Previously, Smith has directed three episodes of Supergirl, as well as three episodes of fellow DC TV stalwart, The Flash. These episodes have been, on our opinion, some of the very best that have hit the small screen - although, we're still praying he gets a crack at Arrow in the future. Are you excited to see Kevin Smith back on Supergirl this season? The hit DC Entertainment drama returns Sunday, October 14th.